The Oodnadatta Track is an unsealed 620 km (385 mi) outback track between Marree and Marla via Oodnadatta in South Australia. The track follows a traditional Aboriginal trading route and provides 4WD travellers with stunning mild desert scenery which is reasonably accessible. Along the Oodnadatta are also numerous springs feeding water from the Great Artesian Basin, the most accessible examples being the mound springs found in Wabma Kadarbu Mound Springs Conservation Park near Coward Springs, however after rattling along for hours on the mostly corrugated track, our sights we set on a detour to southern parts of Lake Eyre for a look – see image below at a great lookout 90kms before William Creek. About another hour along as the temp slowly rose into the mid 20’s, we came across a Western Brown Snake crossing the road which we stopped to safely let pass, but not before Aidan jumped out and took a quick vid on his iPad – see link in above image to view. 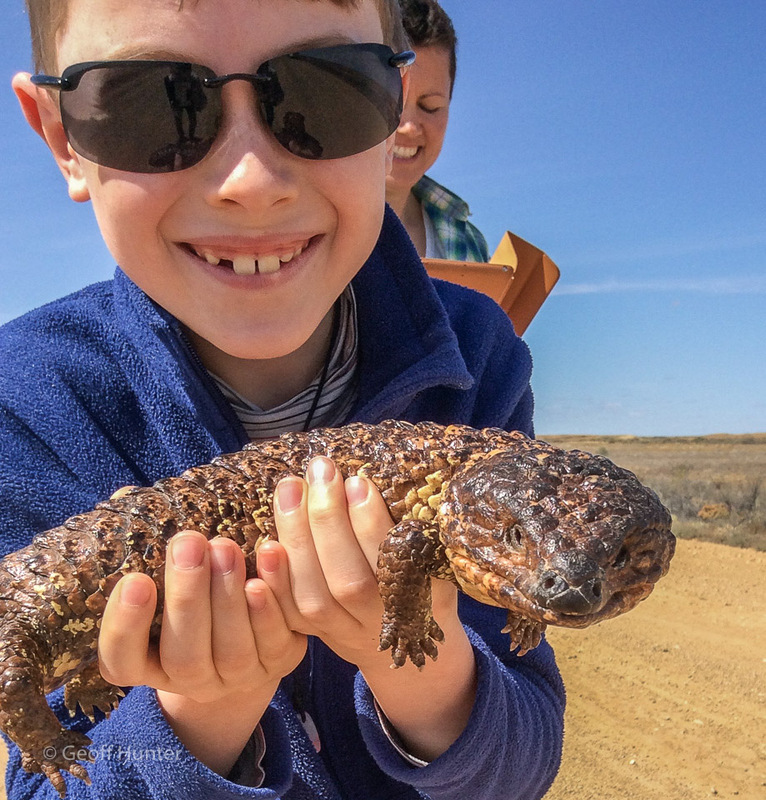 About another 20kms on, we came across the 2nd wildlife encounter of the day, stopped again, and Lochie enjoyed eyeballing this not so little Shingleback with the photo taken by Aidan. The reptile was cool, calm and collected and acted as though he gets picked up by every passing by 4WD tourist every other day and when we put him back down off the road, he casually wallowed off like nothing ever happened. A little 2:00pm, we briefly stopped for a quick bite at the famous William Creek pub for a “dog’s eye with dead horse” washed down by a cold (light) beer. The temp was early 30’s by this stage and was good to stretch the legs for a bit. 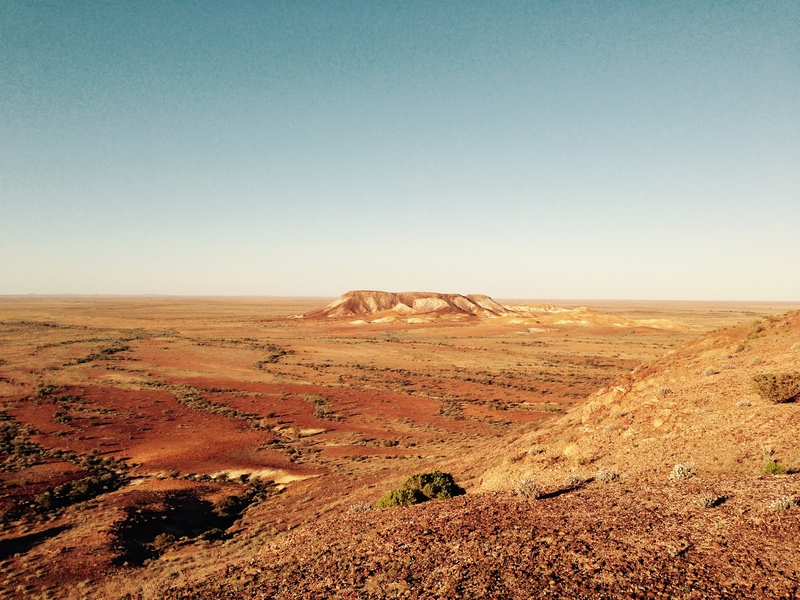 On to Coober Pedy – the moonscape in this strange mining town is littered with tens of thousands of mounds of dirt, like anthills. Underground are the opal mines, homes, various accommodations, shops, even a church. It was a constant 23 degrees underground, and most impressively it had NO FLIES! It was very early ‘Star Wars’. 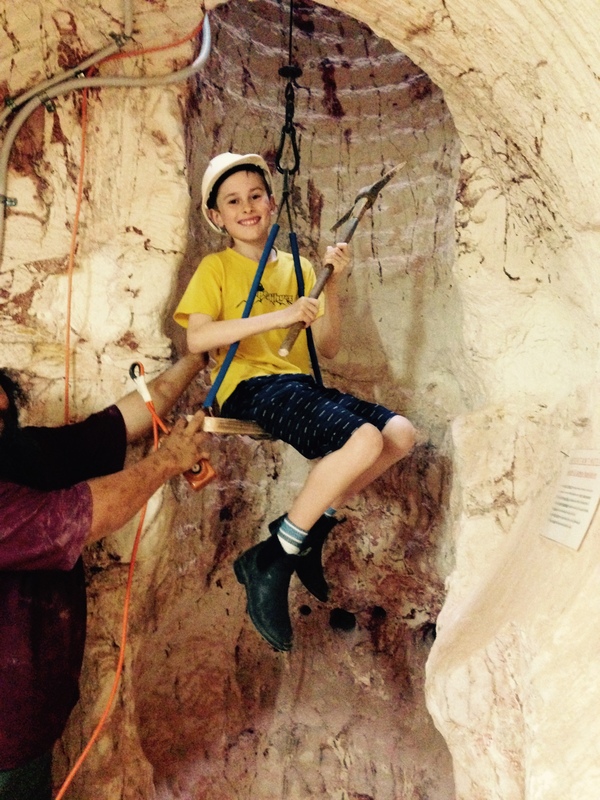 Aidan in a working opal mine shaft with pick in hand – Coober Pedy, SA. Where’s OHS? We toured a working opal mine and the boys went mad ‘noodling’ (common term used to fossick) for opals in any bare patch of dirt they could find. We had to limit though what they could bring in the van, or we would be weighed down with tonnes of rocks! Any type of food is expensive here, especially fresh foods, and we had to purchase water at 20c for 30L as regulated by Coober Pedy council and tasted great as its filtered by the great artesian basin as well as some type of modern reverse osmosis system. It’s a very dry, dusty and arid area , but at the same time a very striking landscapes. 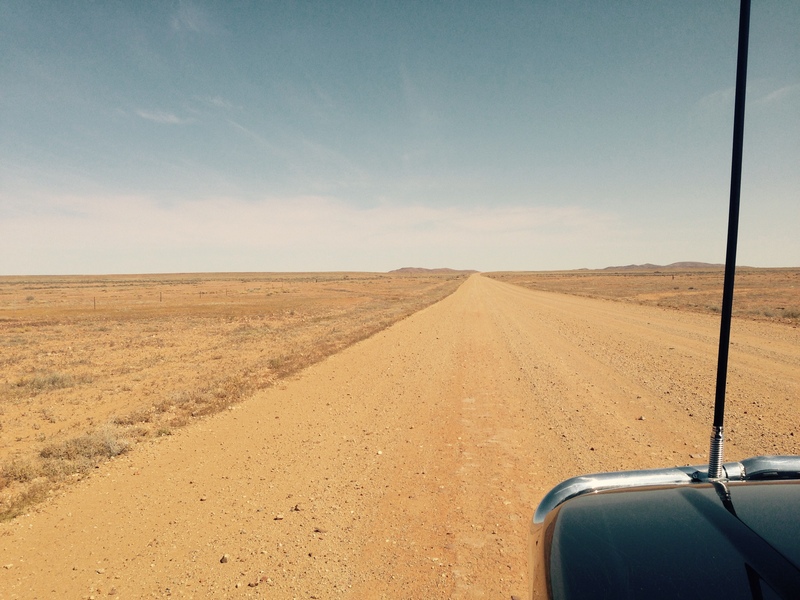 Looking north from the breakaways approx 30kms from Coober Pedy. Shot taken by Celia on her iPhone. We then headed northward, and pushed through our longest day yet into the Northern Territory to a cattle station called Curtin Springs – real central Australian bush – more about this in the next blog. Thoroughly enjoying the photography – made me revisit your FLKR site Geoff, Don said he thinks you have attracted a few more of our friends as followers of your awesome work!